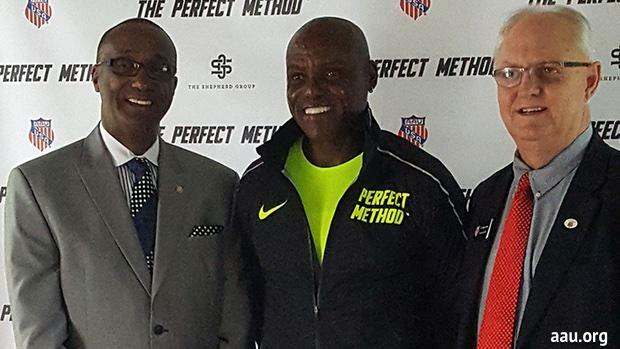 HOUSTON, TX -- On Tuesday, May 9th, the Amateur Athletic Union (AAU) and Carl Lewis' The Perfect Method (TPM) will announce an exciting three-year agreement designed to solve an urgent problem in youth athletics today. The two entities believe that by leveraging their respective brands together, they will optimize the opportunity to offer coaches and young athletes the tools to maximize performance and reach their athletic potential. The relationship will debut nationwide and expand on a global level. The collaboration will begin immediately and the organizations will be announcing programs and a series of co-branded events for the 2017 calendar year, including training clinics for coaches and athletes. The Perfect Method is a step-by-step training program established by Carl Lewis, five-time USA Track & Field Olympian, and winner of ten Olympic medals, nine of them Gold. He is heralded as one of the greatest athletes in the history of modern sport, named Sportsman of the Century by the International Olympic Committee. Lewis was raised as an AAU athlete and credits the organization for helping him develop as a young athlete. An activist for family, youth, education, wellness and fitness, Lewis brings his international celebrity to attract awareness to these issues. He is also serving as an assistant coach at the University of Houston, his alma mater. "I'm excited about our partnership with the AAU. I started sports with an AAU Club that my mother had started," Lewis commented. He added, "I look forward to helping these young coaches and families become the best that they can be. Life comes full circle." The Amateur Athletic Union, founded in 1888, is a multi-sport non-profit organization that promotes and develops amateur sports. For 129 years, the AAU has been instrumental in the lives of young athletes from all walks of life. "The Amateur Athletic Union continually searches for ways to further develop athletes," said Dr. Roger J. Goudy, AAU President/CEO. "We feel the partnership with The Perfect Method can only enhance the training experience for all our members." As part of the agreement, AAUTF members will enjoy the opportunity to trial The Perfect Method online coaching portal. Coaches will be able to teach TPM skills to their athletes and will be fully equipped to help these athletes reach their full potential. The new agreement between AAUTF and The Perfect Method stemmed from the strong desire on behalf of both organizations to ensure that young athletes today have access to the best training possible. Utilizing the AAUTF's infrastructure of events and competitions in conjunction with The Perfect Method's technically sound approach to training both on and off the field of play, the collaboration is designed to maximize the value of both brands with the end goal of helping young athletes thrive in today's complex world. AAU Track & Field Chairman Charles Oliver, known as "Coach O", is an instrumental component of the partnership with The Perfect Method. Across decades in the sport of track & field, Coach O has cemented a lasting legacy of excellence that continues to this day. An All-American at Troy University, Oliver set records in the 400m. In 1989, he founded Bags By Coach O, a company specializing in athletic bags, team apparel, and track and field equipment. The track & field icon lends his expertise to the collaboration with The Perfect Method and will serve alongside Carl Lewis in spearheading the programs. "The mission of AAU is to provide positive competitive opportunities for the youth of America. Carl Lewis is an iconic figure in the sport of track and field and a product of the AAU program," Coach O. stated. He added, "Our partnership with Carl Lewis and The Perfect Method will provide AAU Track and Field the opportunity to have a global reach as we seek to impact young athletes and their families with our message of academic and athletic excellence."